Watches are designed on the basis of the mechanism of hand-wound PF357. 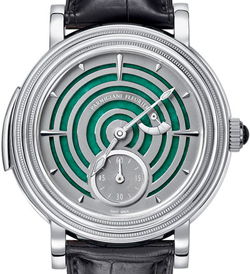 The frequency of oscillation of the balance 21 600 pc / h (3 Hz), power reserve – 72 hours. The mechanism is equipped with an indication of hours, minutes (by means of the central arrow), second (small arrow is displayed on the dial at position “6” h), range (analog pointer to 3 hours). Caliber complicated minute repeater with two “cathedral” gongs and special innovative flywheel eliminates extraneous mechanical sounds. New released a strictly limited edition – only 5 individually numbered copies, comes on a black strap Hermes alligator with buckle in 18-carat white gold.